Now available in a single-volume edition, this exhaustive collection has been completely revised and includes a new introduction by a leading Eckhart scholar. Containing the entire text of all of Eckhart’s vernacular—the German texts, which present his personal reflections on topics such as the poverty of spirit and the birth of Christ in the soul—this treasury is the authoritative volume of Eckhart’s enduring legacy to Christianity. 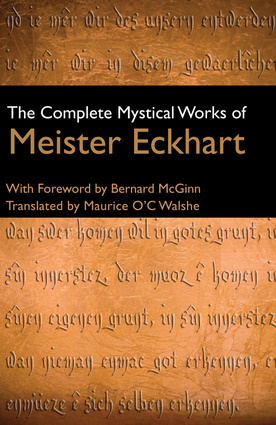 Meister Eckhart was a German theologian, a philosopher, and one of the most influential Christian mystic writers of the 14th century. Bernard McGinn is a professor emeritus at the Divinity School of the University of Chicago and the author of several books, including Early Christian Mystics, The Essential Writings of Christian Mysticism, Meister Eckhart: The Man from Whom God Hid Nothing, and The Mystical Thought of Meister Eckhart. He lives in Chicago. Maurice O'C Walshe was a professor at the University of Nottingham–Leeds and the author of Medieval German Literature.